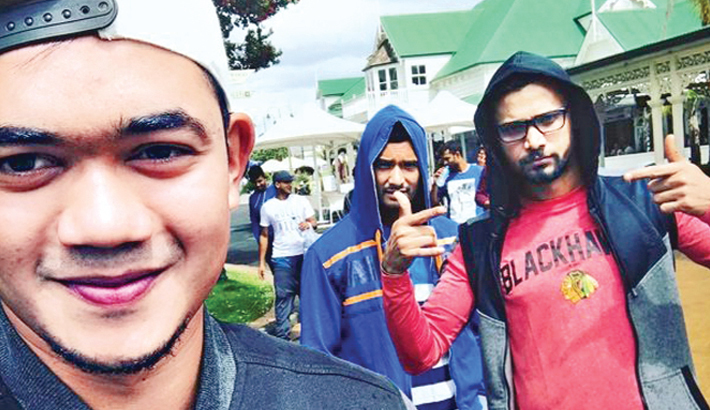 Bangladesh pacer Taskin Ahmed, left, clicks a selfie with skipper Mashrafe Mortaza, right, and teammate Mahmudullah Riyad after their arrival to Christchurch in New Zealand on Friday. Tigers will play their first One Day International match against New Zealand on December 26. This photo is collected from Taskin’s official Facebook page. Completing the conditioning camp with a one-day ‘tour game’ against New Zealand XI at Whangarei on Thursday, the Tigers reached in Christchurch on Friday travelling from Whangarei to play their 1st ODI against New Zealand at Hagley Oval on the Boxing Day on Monday, reports UNB. Bangladesh started their away campaign after around two years break, with a three-wicket loss in a rain-hit warm-up game against New Zealand XI at Cobham Oval, Whangarei on Thursday. The 2nd and 3rd ODI of the series will be played at Saxton Oval in Nelson on December 29 and 31 respectively. Apart from the ODI series, Bangladesh will play three T20I’s and two Test matches against host New Zealand. The Tigers reached in New Zealand on December 18 from Sydney where they had a week-long camp from December 11 to 17. In Sydney Bangladesh played two Twenty 20 practice matches against Big Bash franchise teams Sydney Sixers and Sydney Thunder. The Tigers beat Sydney Sixers by seven wickets in rain-affected match at North Sydney Oval, followed by a six-wicket defeat against Sydney Thunder at the Spotless Stadium. Bangladesh squad for 1st ODI: Mashrafe Mortaza (captain), Tamim Iqbal, Imrul Kayes, Soumya Sarker, Sabbir Rahman, Mushfiqur Rahim, Mahmudullah Riyad, Shakib Al Hasan (vice captain), Mosaddek Hossain, Rubel Hossain, Taskin Ahmed, Mustafizur Rahman, Mehedi Hasan Miraz, Subashis Roy and Tanvir Haider.